Drug-resistant organisms kill an estimated 23,000 people in the U.S. every year, and it is predicted that by 2050 antimicrobial drug resistance will lead to more than 10 million deaths worldwide annually, the researchers write. “… new treatment options to combat antibiotic resistance are urgently needed.” In the hunt for new antibiotic classes, antimicrobial peptides, also known as host defence peptides (HDP), represent what the authors describe as “promising alternative” to conventional antibiotics. 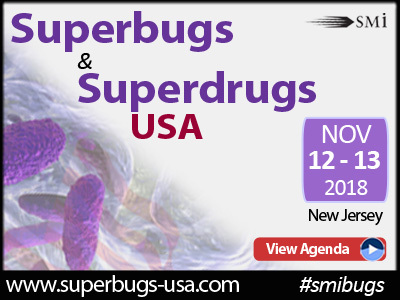 SMi Group is proud to announce the return of the Superbugs & Superdrugs USA conference to Iselin, NJ on the 12th and 13th November 2018. This year’s event will discuss the issue of antibacterial resistance is becoming increasingly prevalent within the world of modern medicine. Difficult-to-treat pathogens create an incredibly real issue within clinical environments; and the problem needs to be addressed with novel treatments and the development of mechanisms which circumvent current therapeutic barriers. The two-day event will explore the ever-growing need of informative and thought-provoking discussion, to address these industry issues, Superbugs & Superdrugs USA conference will offer a jam-packed agenda with presentations from key industry leaders and up-and-coming thinkers, within the field. The next annual instalment in the global series will feature a packed agenda that homes in on expert led approaches to exploring new technologies, novel methods and broadening an understanding of funding and regulation. It will also offer hands on training through carefully selected post-conference interactive workshops, taking place on November 14th.